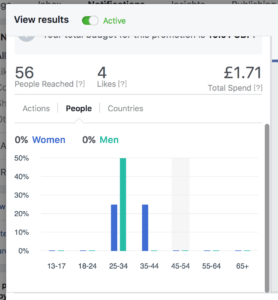 What do you get for £10 with Facebook ads? We haven’t put much energy into our Facebook page so far, but for the sake of our own self-respect we’d like to increase our likes count (it’s currently around 70). So we’re going to try some Facebook ads. We want to reach 200 likes for starters — a nice round tally. I’ve used Facebook ads before. I found it simple to use and pretty good value. If you’re new to it, we’ll try to guide you through the process in this post. We’ll also share our own results. 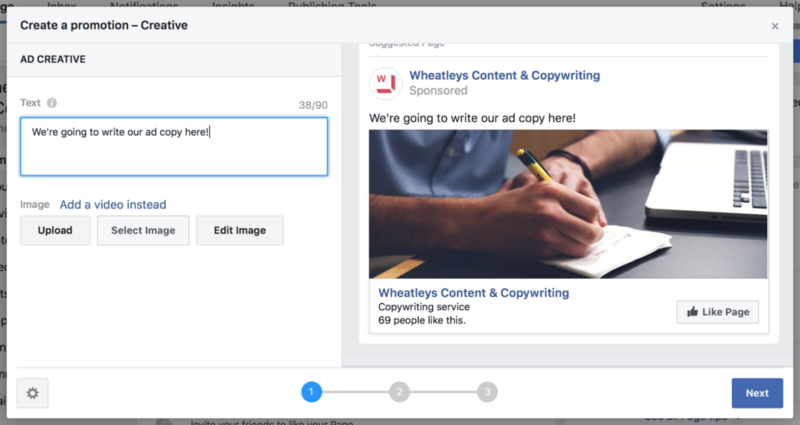 Facebook’s various advertising options are built into the new post form. Very easy to spot. As I said above, our goal here is to increase our page likes. This is because we don’t expect many people are looking for writers on Facebook. We just want a respectable number of likes, to show anyone who visits that our brand (which is new) is in good health. Your goal could be different, like getting clicks through to your website or more phone calls. You get a more detailed set of choices after clicking one of the colourful boxes. We opted for ‘Promote your Page’. The next step after picking a type of advert is to decide who we want our advert to reach. 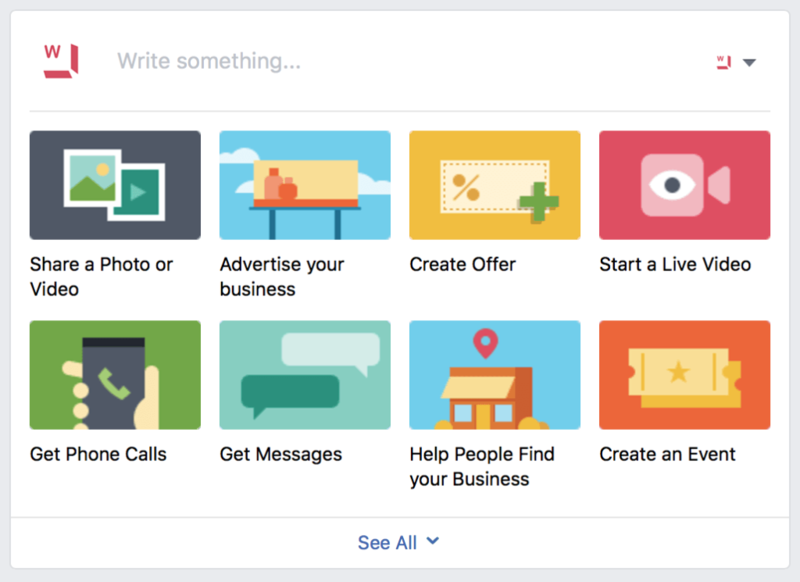 Facebook doesn’t ask us this directly (yet), but it does ask us to provide our ‘Ad creative’ at this point. We should therefore think about who our audience is, so we can write ad copy/text and choose a picture or video that will appeal to them. We create our ad with this simple form. We decided we’d go for small businesses in our local area of Manchester and the North West of England, since we’re focused on SME clients and we’d like to be better known in the area. We don’t really need to be more specific or scientific than this at the moment, since we’re just having a trial run. Discover a top marketing partner on your doorstep. Like us for useful tips and insights. 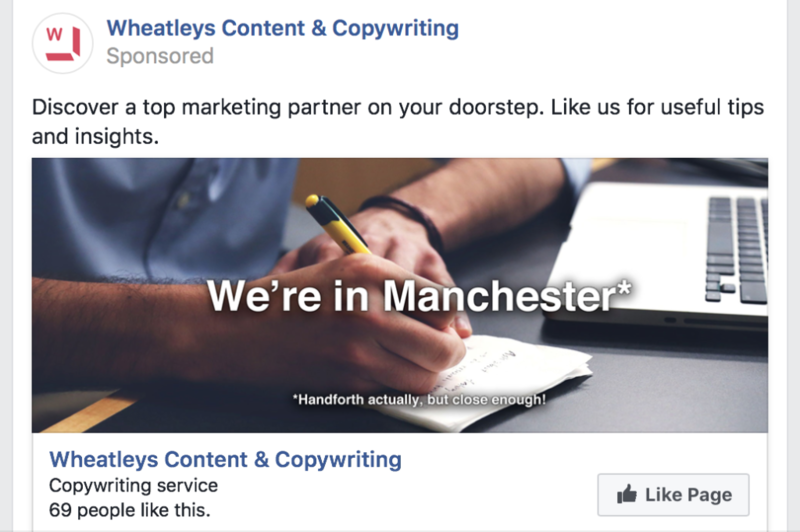 The asterisk allowed us to target Manchester, be transparent about our location (it’s just over the Cheshire border) and make a silly little joke. Asterisks can raise curiosity. 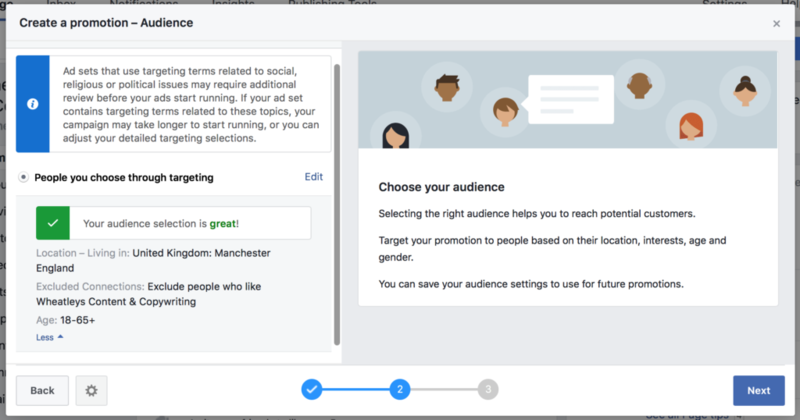 With our ad ready, we click Next and see a new form that asks us to choose our audience. Apparently our audience selection is “great” — and we’ve not even done anything yet. We still want to refine our audience a bit though. One of the brilliant (or dangerous?) 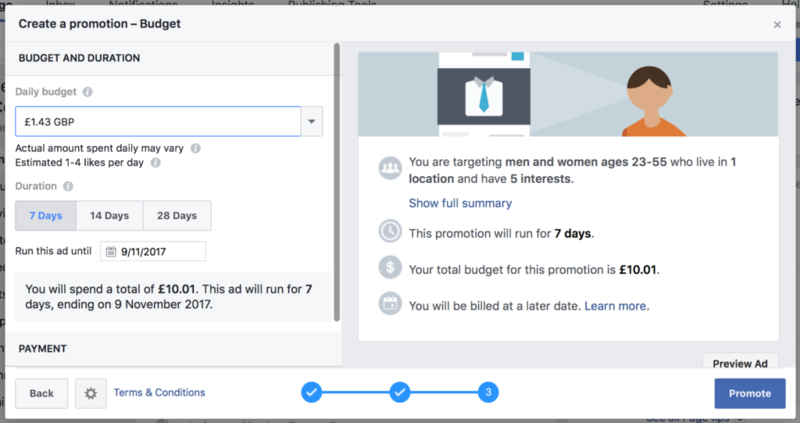 things about Facebook ads is how easy it is to target very specific groups of people based on their age, gender, location and interests. We include people in Manchester, Salford, Bolton and Stockport. We use ‘Detailed targeting’ to only target people who say they’re interested in ‘Copywriting’, ‘Small business’, ‘Entrepreneurship’, ‘Content marketing’, ‘Digital marketing’ and plain-old ‘Marketing’. As I mentioned in the title, we’re only going to spend £10 on this experiment. So we may as well start small, then increase the spend later if we want to. Thankfully it’s easy to set a maximum spend. After clicking Next on the audience form, we see a new step called ‘Budget and Duration’. We set our daily budget to £1.43 and our duration to 7 days, and that adds up to £10.01 (because 10 / 7 = 1.428). It’s really easy to control budget, audience and duration. We also get a prediction about the results — how accurate will it prove to be? Facebook now tells us we can expect 1-4 likes per day. This means we could get only 7 new likes for the £10 we’re spending. Or we could get a maximum of 28 new likes for our tenner. That will depend on how good the advert is… and let’s face it, ours is nothing Earth-shattering! After one day we had 4 new likes and had spent £1.71. That’s at the top-end of the prediction Facebook gave us earlier, which is nice. The daily spend is higher than we asked for, though. One of the new likes was from Mexico City and living in Mexico City. That’s a few thousand miles outside our target. I’ve no idea why this happened, but it shows Facebook’s ad targeting is perhaps not as accurate as it should be. One of the new likes ‘unliked’ the page shortly afterwards, so our net change is actually +3. You pay for likes whether they stay with you for five years or five seconds. At the end of our promotion we had gained just 13 new likes for our £10 spend. And not all of those had stuck around! If you recall, Facebook predicted we’d get between 7 and 28 new likes. We’re within that range. But at 77p per like, I can’t help conclude this campaign has been poor value and a failure. We really want to be at the top end of Facebook’s prediction, getting the biggest value from our spend. Thankfully, it’s ok to fail if you learn from your mistakes. We didn’t work hard enough on our creative. Our target audience, which included small business owners and people interested in marketing, are a savvy group. We should have put more energy into our ad creative if we wanted to win their clicks. Our target audience didn’t really fit our goal. I said our campaign goal was simply to increase our total page likes. If that was really the case, we should have selected a demographic known to ‘Like’ pages more often. Instead we got greedy and tried to kill two birds with one stone, targeting people who might also be interested in our service. The likes we won might be more valuable than if we’d just gone after anything we could get. But we failed to make real progress towards our stated goal of 200 likes. Winning Facebook likes isn’t as easy as I thought. This is probably the most useful lesson of all. 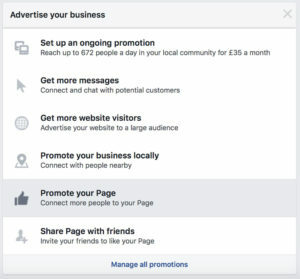 Facebook advertising is not just a pay-to-win video game. It takes some skill and science, and we now need to think about how to improve on the results of this first experiment. I’ll be back soon with a new post and a new round of Facebook ad tests. I hope you found this one enlightening. In the meantime: if you’ve got any useful lessons from your own Facebook ad experiences, we’d love to hear them! We’ve got bags of creativity and experience and we’d love to help! Click below to see what we offer for small businesses. It won’t definitely improve your results, esp on a small spend like this, but you need better creative. Try a special ooffer, we’ve found this appeals to facebookers. Previous Previous post: Is dlvr.it a good free social media automation tool? We tried it. Next Next post: You want to make a web quiz? You need to try Interact! Specialists in supporting small businesses, marketing agencies, IT and software firms and video game companies.